I decided this past week to finish off some of my ufo’s………unfinished objects 😊 I’m working my way through the pile. This landscape was from a National Park we visited on our long trip around the country. It has been in the unfinished pile for ages, so now there is one less. I think I salvaged it and will hopefully sell it at an exhibition later in the year. I do have a lot more unfinished paintings to work through and I will be ruthless. If I can’t make them work I’ll bin them. 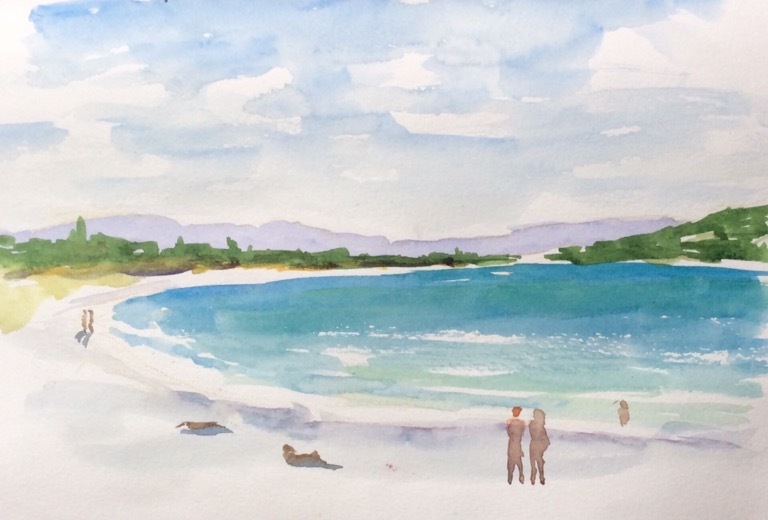 In the meantime I had a morning with the local pleinair air group at the beach. Fine weather but the wind was a little chilly, which always makes me sketch a lot quicker. The first sketch is watercolour on cartridge paper. 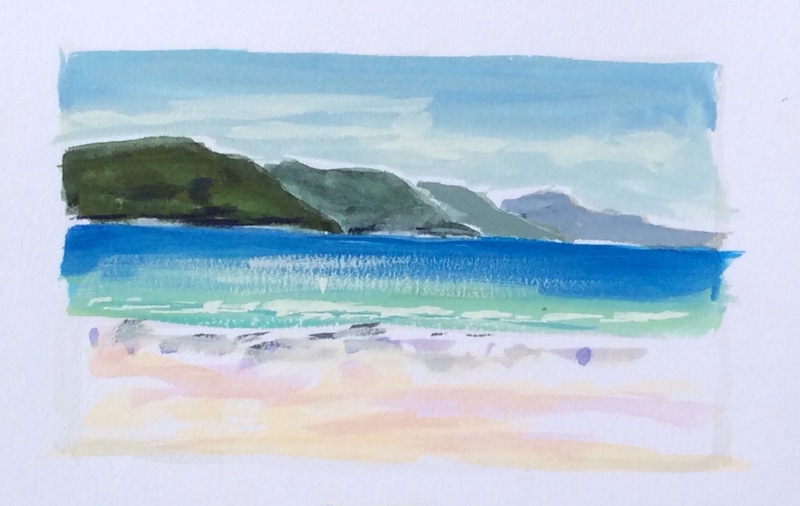 The next one was a little gouache, looking across the bay. And then I went for something completely different, a larger acrylic on canvas. I haven’t painted with acrylic for a long time and I forgot how much darker it dries, opposite to watercolour. This is 600 x 450 mm or 24 x 18″. Another one for the exhibition? I finished Every Day in May and I thought I would have a break from sketching. No more feeling obliged to do that daily sketch even if I didn’t feel inspired. But …….. I missed it. So I joined in with the June facebook group, but I’m not committing to every day, just when the mood strikes. I’m aiming for quick 20 minute sketches using a sketchbook not really suitable for watercolour. 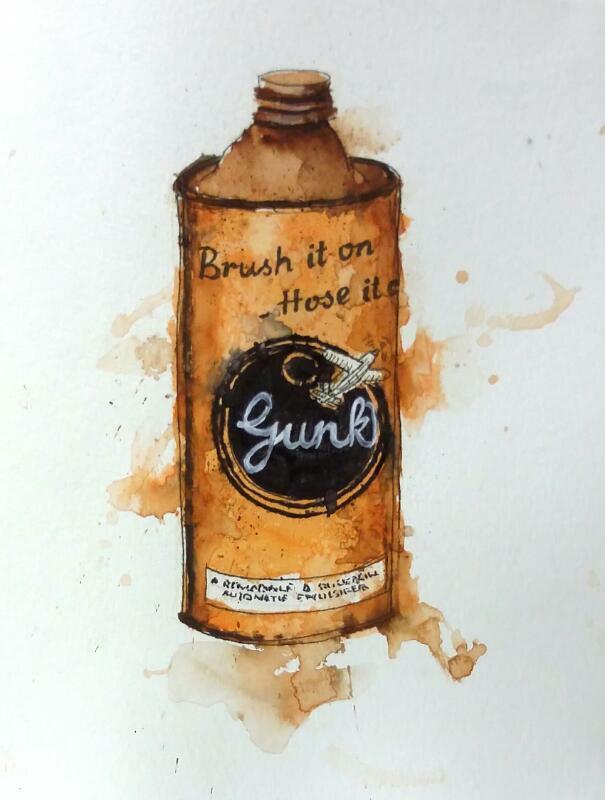 Its all about getting extra miles on the pen and brush so I’m using up what is on hand. I won’t subject you to all of those sketches, just the occasional one. Like this one. The prompt was music. Back to acrylics. This was the final lesson in Patti Mollica’s Strathmore online tutorial using a photo from the weekend challenge on Wetcanvas. 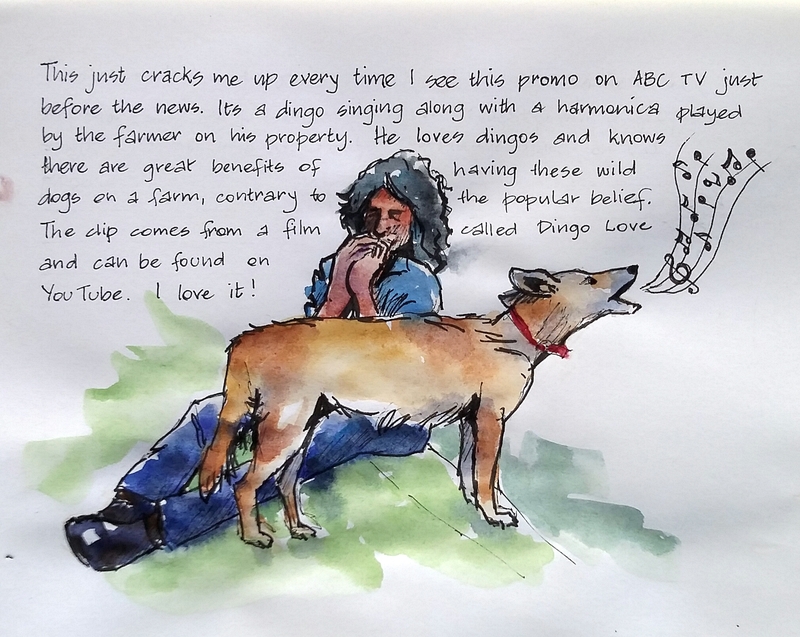 The photo was a farm scene in southern Queensland provided by Aussie sketcher. 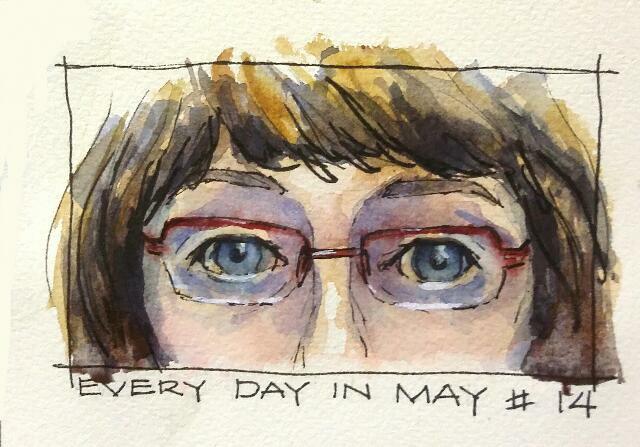 Every Day in May sketches again. Yesterday’s prompt was for a cupcake. No cupcakes in my house…….. I don’t really even like them but they do look good. 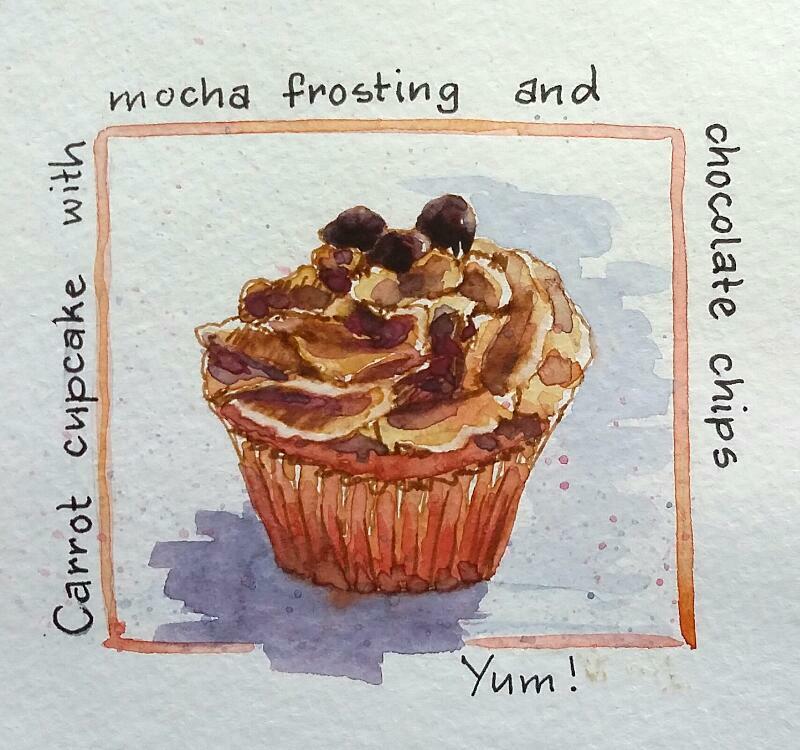 Rather than google a cupcake to paint I cheated and posted one I had done some time ago. I just didn’t feel like sketching one yesterday. 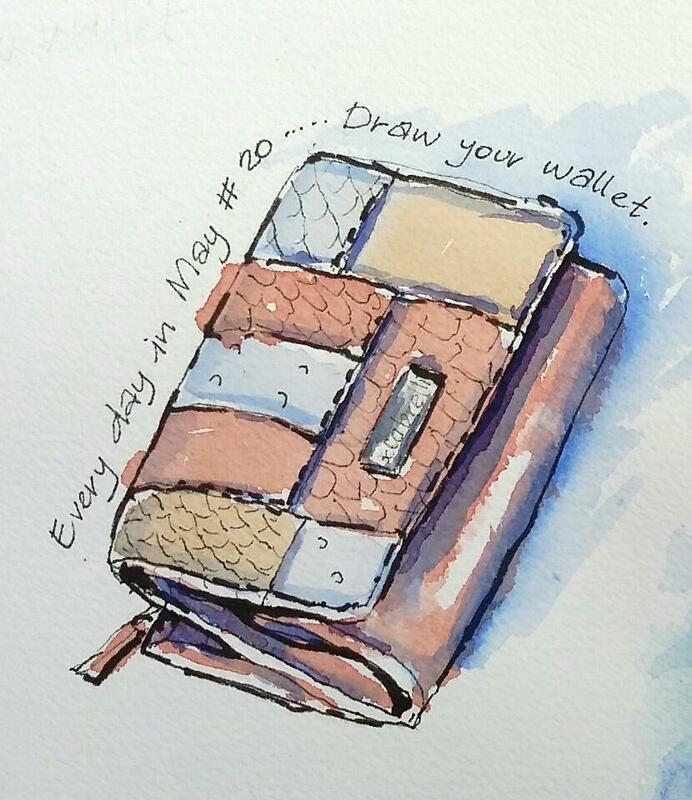 This was done in a Strathmore watercolour visual journal with brown tombow marker and watercolour. I love this wallet after having a plain old black one that was almost impossible to see on black seat covers in a dark garage. It’s much easier to spot than my old one. This morning I checked in the Strathmore online workshop for lesson 3. Pears! 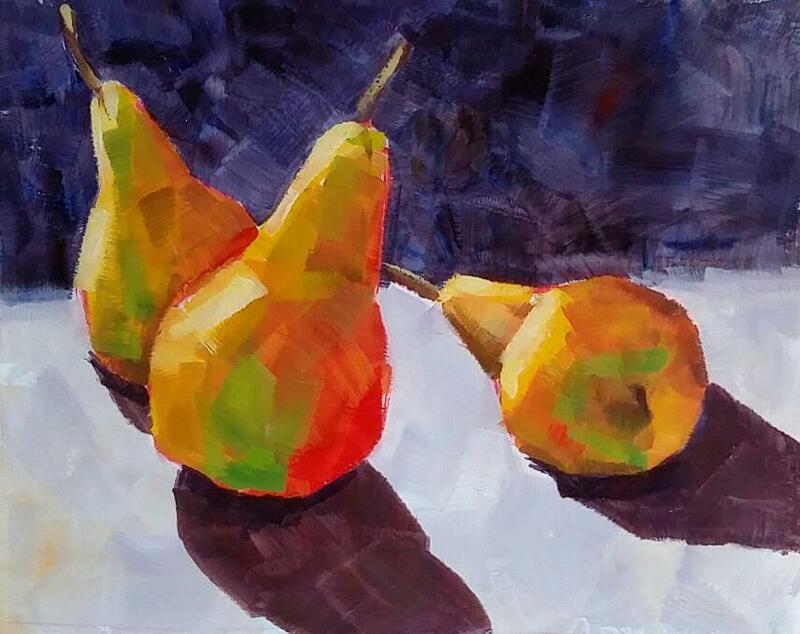 Its aways great to paint pears and it was another great lesson in limited brush strokes with one brush. I did manage to find a new 1 1/2″ brush and used it on this. I have a few pics today. A bit of a back log. 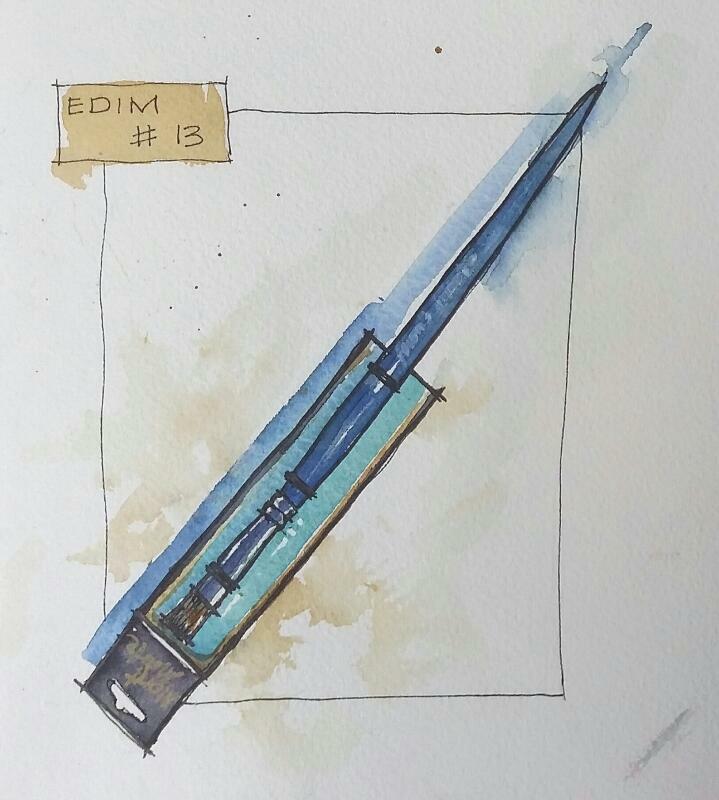 I have been doing my EDIM sketches daily, well almost, but now I have caught up to #14 on the 14th. 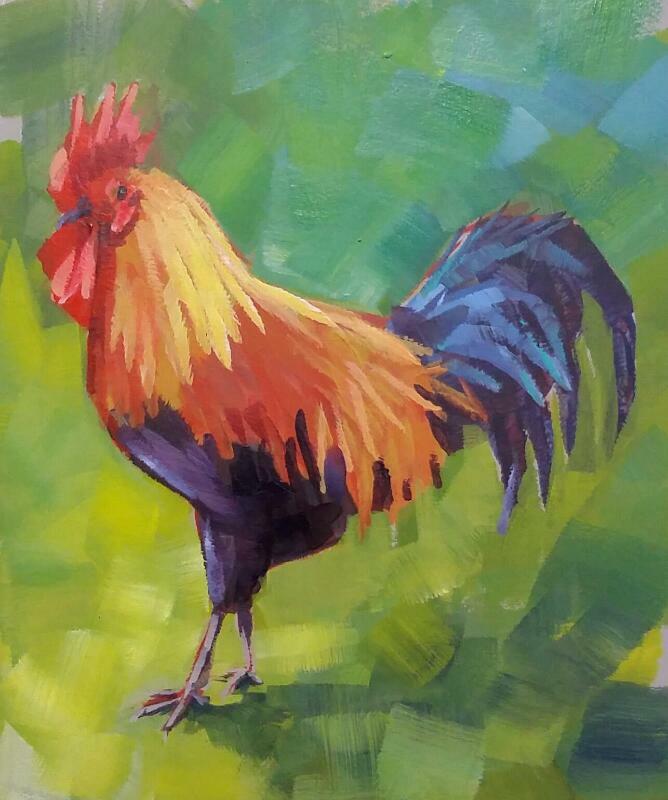 First is my acrylic rooster painting from the Strathmore online workshop with Patti Mollica, still trying to master using one brush. It is a challenge but I always like a challenge. The prompt for the Every Day in May #12 was for stairs or steps. 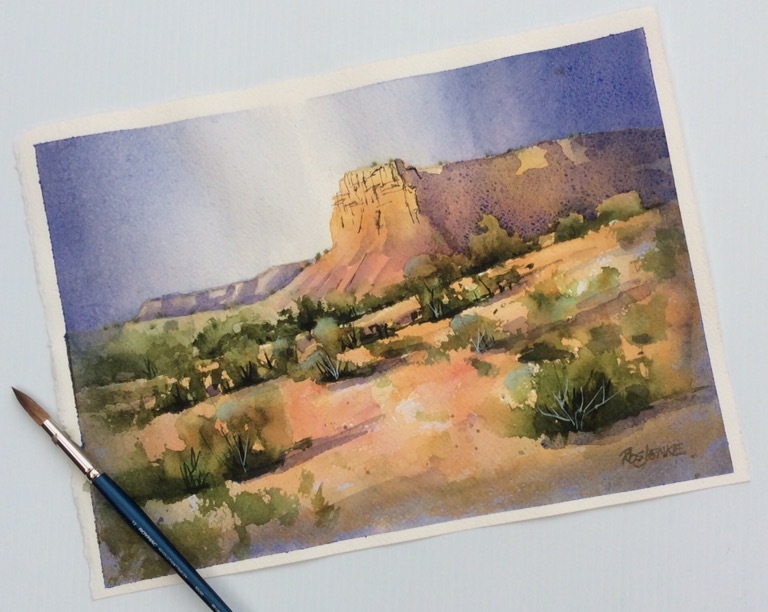 I painted this in my Canson Montval journal, just to see how it compares with the Saunders paper I have been using for these sketches. I think I prefer it to the Saunders which I find is too slow drying for this quick sketchy style of painting, and the colours don’t seem quite as vibrant. Day 13 prompt was for the last item you bought. Surprise that it just happened to be a paintbrush. Funny how art supplies just seem to jump into the shopping bag. I thought this brush looked pretty good for gouache. This is back to Saunders paper. A productive day today. I forgot that I had signed up for a Strathmore online workshop with Patti Mollica. I have always admired her use colour and bold brushwork so I decided to give it a go. 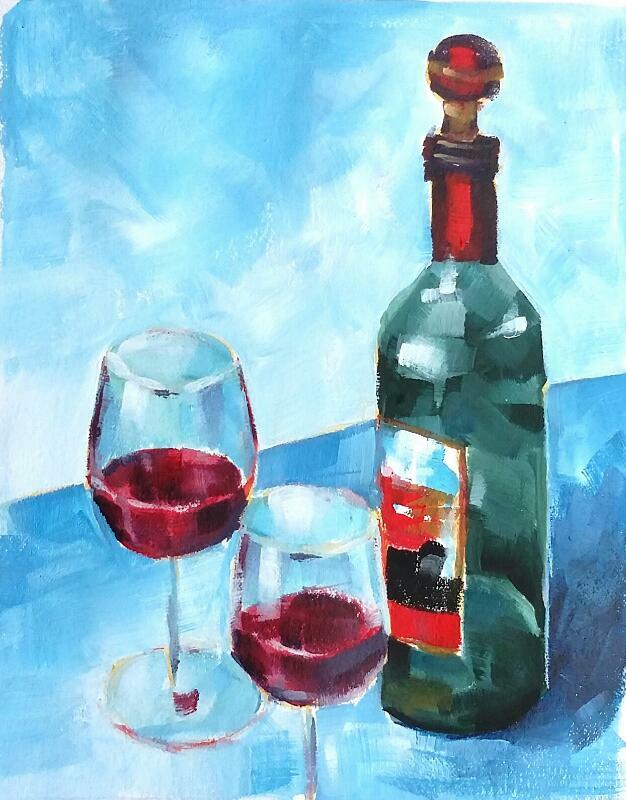 I found my old acrylics – not the heavy body type that she uses, and a 1″ acrylic brush – she uses a 2″. I really don’t want to go out and buy more art supplies, just need to try and use up what I have. So what the heck, just give it a go. Her method is really quick, especially if you had the right supplies, but even so each painting took less than 1 hour. Pretty fast for me. 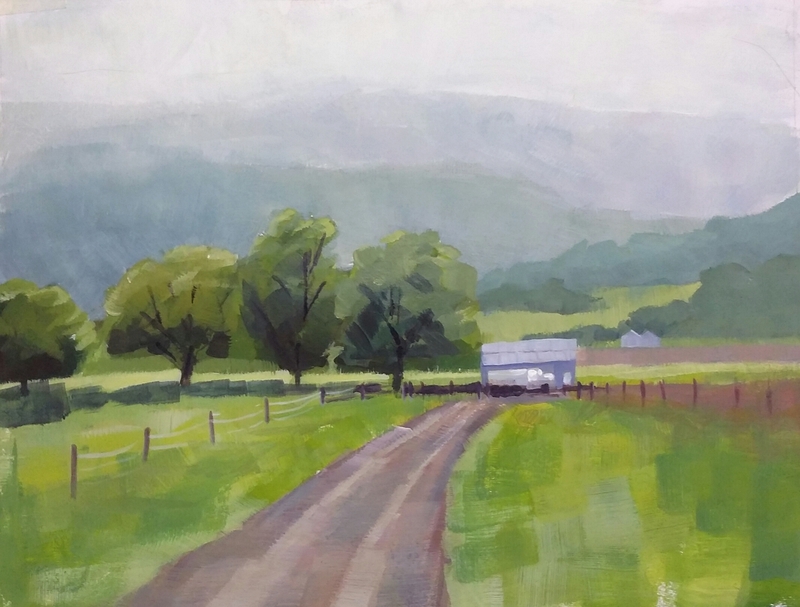 This is my painting from the workshop video, with just 4 colours. As I had a palette of leftover paint I thought I’d do another. 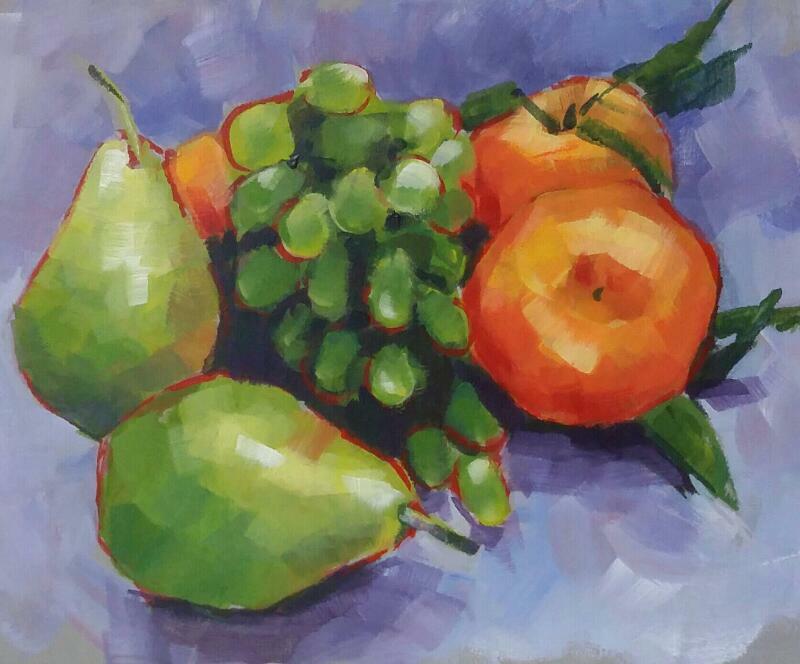 This still life was from the Wetcanvas 2 hour challenge, photo supplied by jloren. I cleaned the acrylics away and seeing there was nothing worth watching on TV came back into my painting room and did my daily sketch for EDIM. Something with an interesting label. Another treasure from “THE SHED”. I’m still around and painting, just not posting. This is a work in progress that I started a couple of weeks ago and it is still a work in progress sadly. Sitting there looking at me each time I go into my painting room…. grrr. 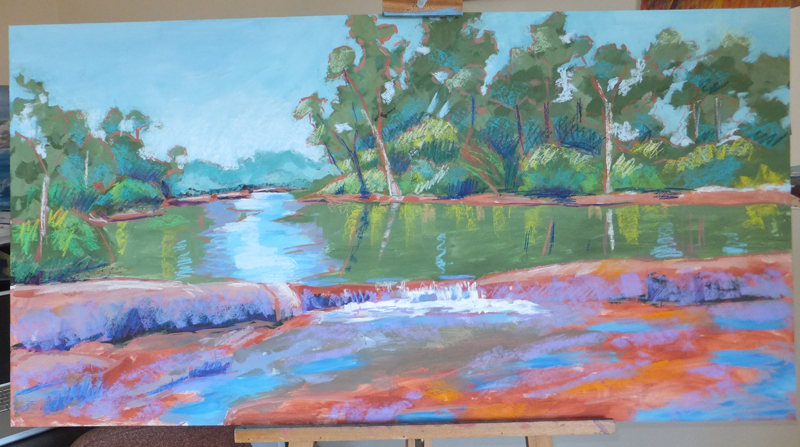 The trouble is that it is acrylic – and huge for me 120 x 40cm. I haven’t painted in acrylic for a long time and it is taking me a while. I scribbled over some places with pastel to work out some direction. But it will be a peace offering to my hub who wants a large landscape and complains that I always give away my decent stuff. 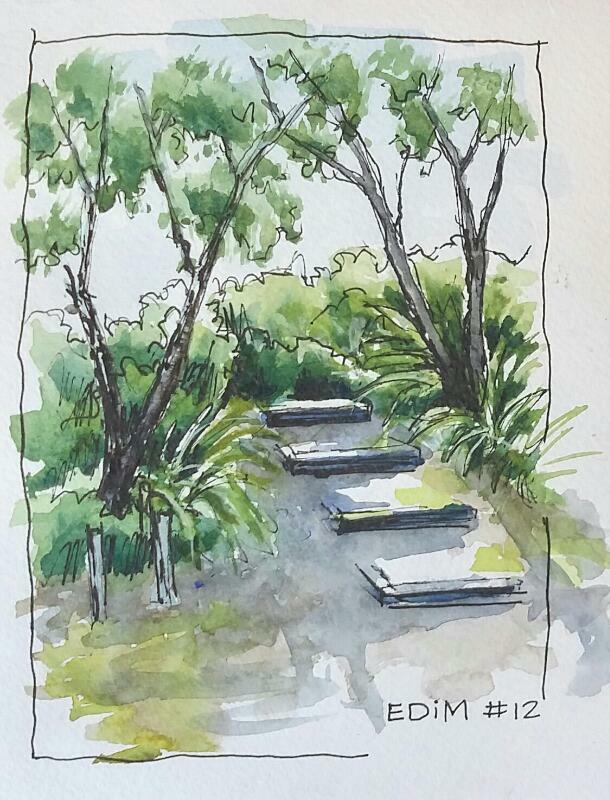 Its from a photo of one of the places we visited on one of our trips around Oz. 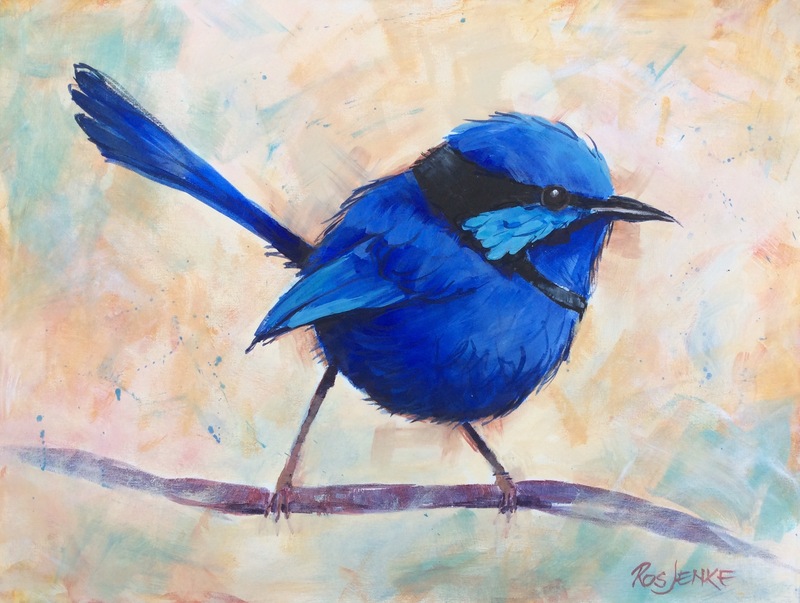 I think it will have to sit for a while because I am doing an online spontaneous sketching course with Liz Steel. I won’t bore you with the homework sketches but you can see them on my Flickr page if you are interested. I think I really prefer watercolour or gouache, doing this sort of sketchbook stuff, or maybe it is just that I am sick of the big one. This little one is from WetCanvas – photos courtesy of sundiver.